The front of our house in the early evening. December 10, 2010. Our house is now decked out for Christmas. Not only on the inside but on the outside. As night falls the lights come on. The picture above is taken from the road in front of the house just after the sun went down. Our house after dark, Fairfield Glade, Tennessee. December 10, 2010. Betsy is the designer of our decorations. My job is to carry things and put them where she tells me to, and to reach the high places she can’t reach. She’s added the wreaths in the front over the past three years. Our Christmas tree from the back yard. December 9, 2010. Our house opens to the back, where we have three sliding glass doors opening to a large deck. Betsy has decorated the deck with lighted garlands (you can see some of them in the picture above). We put the tree in front of one of the doors and keep the curtains open so that the tree can be seen from the back yard. Pictures don’t do justice to the way the house looks. You’ll just have to stop by to see how it looks in person. This entry was posted on December 14, 2010 at 3:30 am and is filed under My World. You can follow any responses to this entry through the RSS 2.0 feed. You can leave a response, or trackback from your own site. Good Morning George, You and Betsy have done a wonderful job of decorating. Your home looks so festive. I know you often photograph deer in your back yard. They probably have been watching you and Betsy decorate! Have a good day. If only I lived closer,I would be there.It is beautiful. really like that tree in the door. beautiful. and i like the shots from the front in the dark. your house looks so festive. 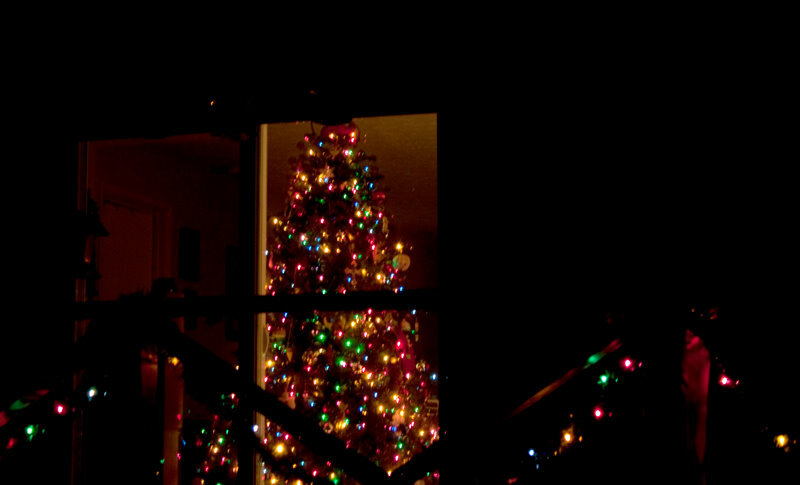 The photo of the Christmas tree from outside is perfect. Just beautiful. I’m with Ruth on this one – if we lived closer I’d come for a visit. Beautiful decorations – a shining light in the dark of night to honor the Child of whom we sing, Christ the Savior is born!! Your Christmas tree looks gorgeous from the back yard! 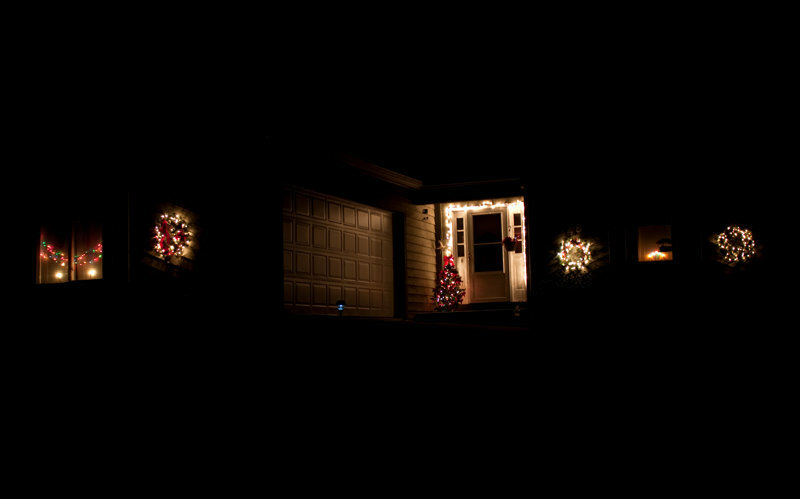 I hope to photograph our house from the street one day, as well as other outdoor decorations around town. An evening that isn’t bitter cold would be nice! I am glad you decorate–so we can enjoy too. 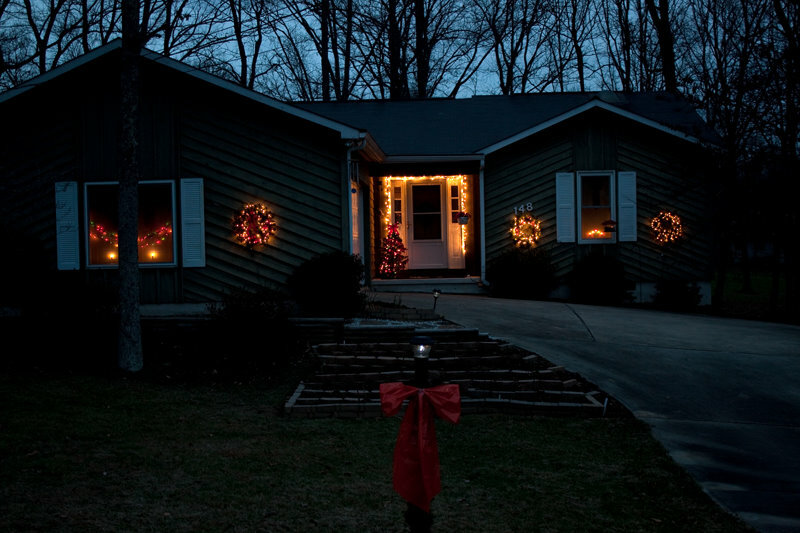 Terrific decorations and your house does look so ready to welcome Santa and the season, George! You and Betsy have done a marvelous job and thanks to your photos, we get to share in the fun and beauty! Have a lovely day! I love looking at people’s trees from the outside, looking in their windows or doors. And yours is spectacular! The lights on the wreaths are a really nice touch too, they really make the house sparkle! I’m glad you showed your tree. I’m always excited to see other people’s tree. Gives me tips on how to trim mine next time. I can just imagine it nice and warm and cozy inside. Looks great !! not overdone like some I’ve seen. Keep it clean and simple. Thank you for sharing your Christmas atmosphere! Betsy has done a great job and everything looks so wonderful. I would love to stop by but its a bit far. It does look very nice. You are a good team. Your home has been beautifully decorated. Very nice night shots. Oh goodness, Betsy has done a wonderful job!! As have you 🙂 you all make a great team!! I love the wreaths. Your house looks like it could be on a Christmas book cover! It is just beautiful! !